Looking for live bands for hire in Dubai? We have many years of experience in Dubai, the UK plus all around the world. We’ve been playing in Dubai for about 20 years and we’ve watched it grow from quite a small place into the incredible spectacle that it is today. One of the first places that we played was the Dubai Yacht Club way back in the 90s. 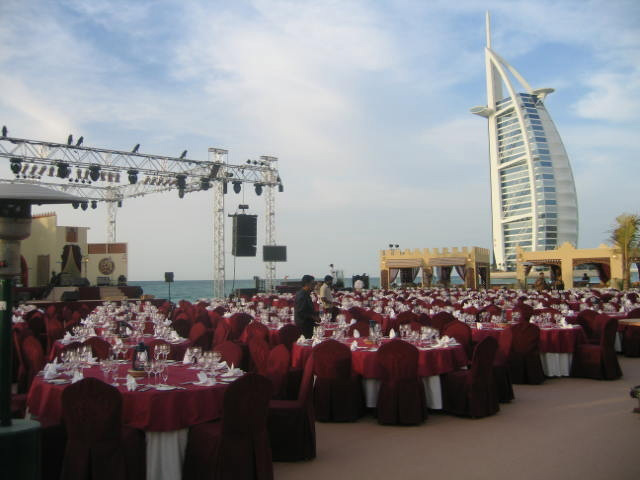 We played at the Jumeirah Madinat Hotel for a few New Years Eves in a row. We played at the Virgin Atlantic party in the grounds of the Burj Al Arab Hotel, when Virgin first starting flying to Dubai, which hopefully brought loads of lovely business to Dubai. We’ve played at the Barasti Beach Club several times, the fabulous Atlantis Hotel on The Palm, The Jumeirah Creekside Hotel, the Jumeirah Beach Hotel and then just this last January we play two nights at the Dubai Tennis Arena in the Irish Village. Over the years we’ve also been lucky enough to work in neighbouring Qatar and Abu Dhabi several times. Always amazing ostentatious parties with wonderful cosmopolitan audiences – we love it! If you have a corporate event in Dubai or a venue in Dubai that wants to play host to some new live music then please get in touch. Looking for Live Bands For Hire in Dubai? Then look no further than Sway Allstars. Please take a look at some of the other venues we have played at, if you still need further convincing that we are the live band you want!